Dunkerque is becoming a popular destination for cross-channel travellers with the regular ferry service from DFDS now offering 24 crossings a day. Although the crossing from Dover takes a little longer (2 hours) compared to the 90 minutes to Calais, with quick access to the autoroutes (toll-free to Lille and Calais, Boulogne) makes little difference to overall travel times. The ships and amenities on board are well up-to-standard, and the port is less busy than its neighbour. The ferry port is some miles out of Dunkerque town at a place called Loon Plage, but it is well signposted to “Ferry” and the roads locally have recently been improved. There is nothing to see at the port, unless you are fans of containers and large lorries. Head just a few miles west and you come to the small coastal town of Gravelines (59 Nord, Hauts de France), where there are shops and a Vauban fortification, from the days when the port was an important strategic point on the western edge of the Spanish territory of Flanders in the 12th century. 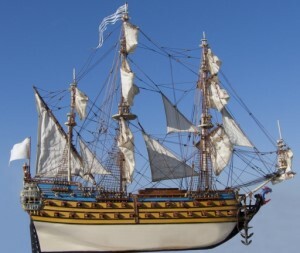 Here there is also a fascinating project to build a 17th Century Warship, the Jean Bart. This is a sister project to the renovation of the Dunkerque veteran “Medway Queen” in Bristol under the umbrella of the Heroes2C initiative, which is designed to preserve maritime history, whilst creating jobs particularly for youngsters. The bare bones of the hull are in place, and it is an enormous and impressive structure (187 feet long). The timber used is immense – to construct the keel and the “transom” – the bit at the end which should hold everything together! The project is about building a medieval ship – I doubt if it will ever sail, as the boatyard is some 100 metres from the water, there is no slipway to launch it down and it will weigh 1400 tons when completed! But as the French seem to be saying, the purpose is to gain experience of the construction and being part of a big idea! Well worth a visit over the next few years. There is a café and shop on site – look for signs to “Association Tourville”.